Former Minister of Aviation, Femi Fani-Kayode has reacted to Gov Rochas Okorocha, and Ibikunle Amosun's threat to exposed a hidden secret in Aso Villa. On his official Facebook page, he said that "There is something rotten in the APC that stinks worse than a dead body." He also recalled that he warned Nigerians about Buhari’s fake certificate in 2015, now he is warning about his fake identity. "If APC provokes me again I will tell the whole world what we were cooking that got the house burnt"- Gov. Amosun. 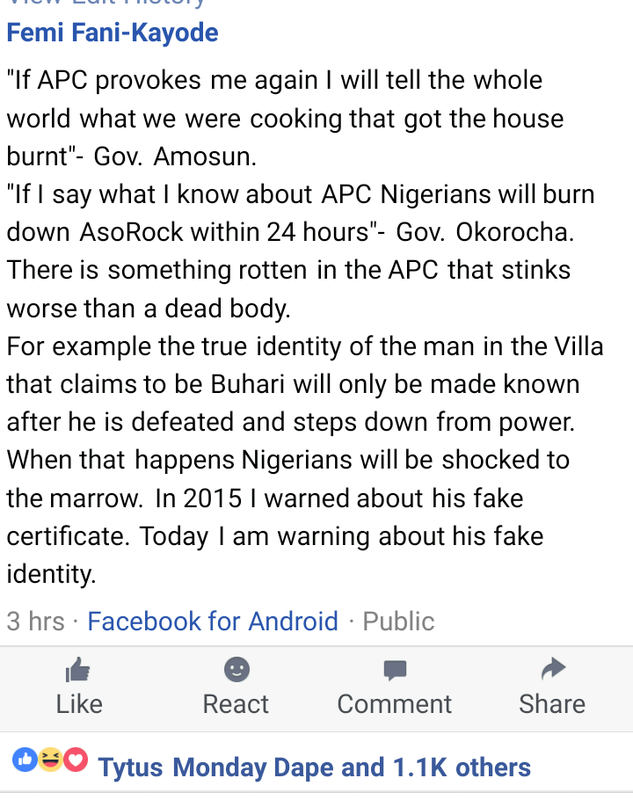 "If I say what I know about APC Nigerians will burn down AsoRock within 24 hours"- Gov. Okorocha. Reacting he said, "There is something rotten in the APC that stinks worse than a dead body. "For example the true identity of the man in the Villa that claims to be Buhari will only be made known after he is defeated and steps down from power. "When that happens Nigerians will be shocked to the marrow. In 2015 I warned about his fake certificate. Today I am warning about his fake identity.